Well, this is my first blog in some time. Having had a wedding to plan and execute, followed by a lovely two-week break in Sri Lanka, cooking and blogging has been on the back-burner for a while. But after an amazing wedding and honeymoon, I’m back in the game! Last night I went to Mildreds in King’s Cross. I went to the flagship Soho branch a few years back, but the lack of opportunity to book a table in a tiny restaurant put me off going back. The no-booking policy still applies to their new branch, however, the restaurant is much bigger so the wait to be seated is less of an issue for those of us easily hangered. In fact, as we got there just after 6pm on a Tuesday, we were seated straight away. 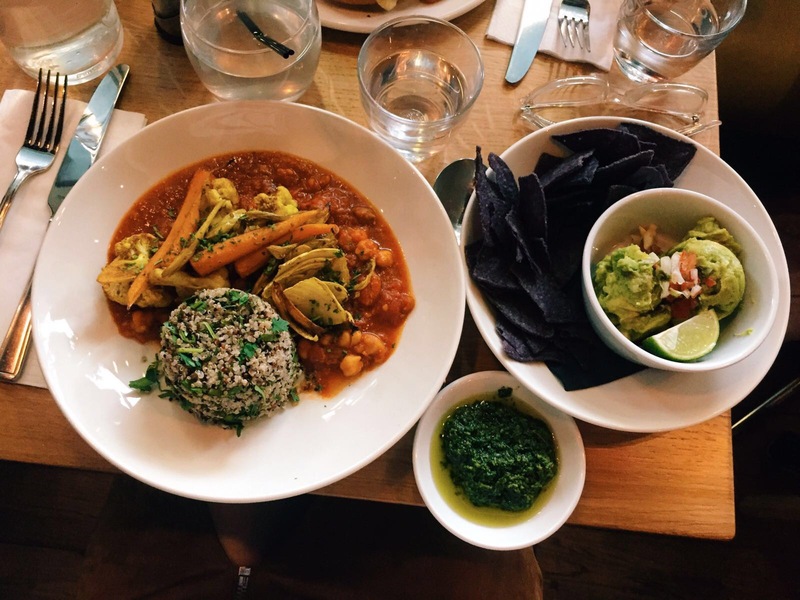 Having opened its first Soho restaurant in the 80s, Mildreds has been serving vegetarian food to the capital for almost 30 years. When I moved to London seven years ago, it was the go-to place for vegetarians. It is something of an institution. Serving an array of dishes from across the globe – everything from curries and tagines to burgers and pies – there is something for everyone. Earlier in the day, I’d made a feeble resolution with myself that I would order something healthy, but despite my well-to-do mental note, I couldn’t resist the classic smoked tofu burger. Now this is a proper veggie burger. None of that ‘cheese-and-vegetables-in-a-brioche-bun-posing-as-a-burger’ malarky, but a full-on brick-sized patty made up of smoked tofu, lentils and piquillo peppers, topped with melted cheese, rocket, relish, red onion and tomato. It was hearty and tasty. My only criticism is the raw onion; it’s not worth the lingering smell on your breath. I ordered chips and basil mayo on the side. The chips were fat and crisp, and as a salt fiend, they were served well-sprinkled with rock salt. 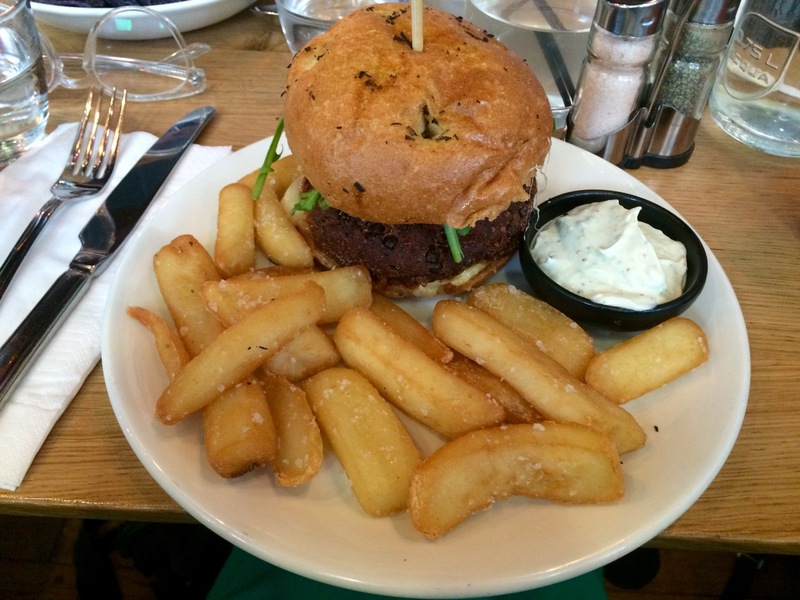 The basil mayo was creamy and dreamy, and made an excellent dipping sauce for both the burger and chips. I opted for a more virtuous drink option to wash it all down with; a strawberry, pineapple and apple juice. 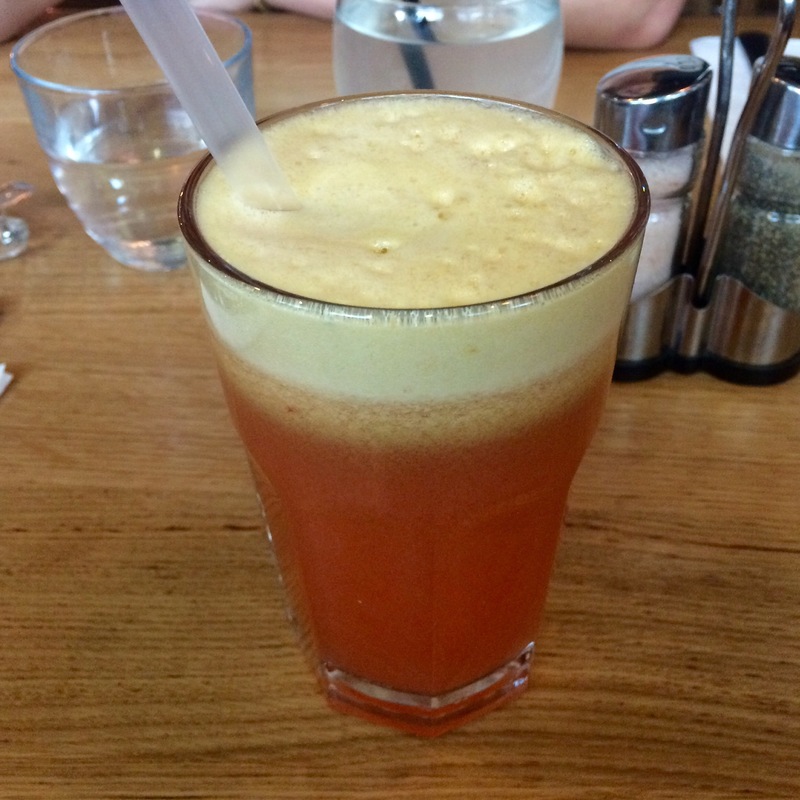 It reminded me of the room temperature juices Wagamama serve. Thick, fruity and sweet. A little on the pricey side for £4.25 perhaps. If you’re after a less carby option, my friend opted for the chickpea, cauliflower and apricot tagine, which was presented beautifully with a side of quinoa tabbouleh and green harissa. And a side of every foodstagrammer’s favourite, smashed avocado with blue corn chips. For a return visit, I think I’d opt for a couple of small plates. The chilli, lime and mirin fried tofu with mango soba noodle salad sounds delicious, as do their dips. The staff were friendly and attentive and the atmosphere was relaxed. The place was packed and buzzing by the time we left. I’d definitely recommend giving this newer branch of Mildreds a go. Amico Bio is a vegetarian restaurant specialising in healthy and organic Italian food. With authentic ingredients sourced from the owner’s family farm in Italy and with an ever-changing menu, you know you’re getting the good stuff here. There are two branches in London. I’ve been to their Barbican restaurant twice before; and both times the standard of food and service was great. For Valentine’s Day, we decided to try its sister restaurant on New Oxford Street for a change. There was a four-course Valentine’s set menu, including a sparkling cocktail. Having had some disastrous Valentine’s experiences in the past – with restaurants not having our reservations written down and the like – we were pleasantly surprised when we could choose where to sit on arrival. The restaurant was pretty quiet for a Saturday night in central London, but I wasn’t complaining! I opted for the Spaghetti di zucchine, misticanza, peperoni e basilico i.e. 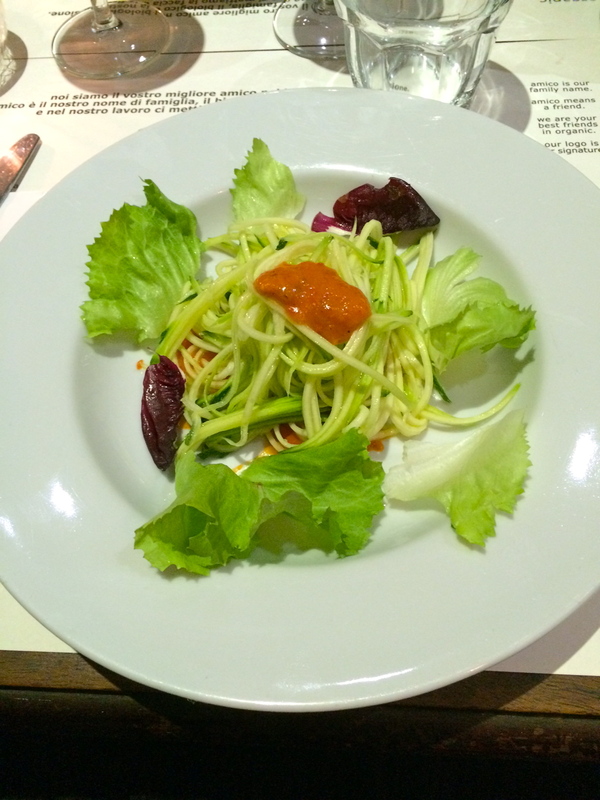 courgette spaghetti with mixed leaf salad, pepper sauce and basil. I’ve got to say, this was my favourite course. Substituting pasta for vegetables is very en vogue at the moment, especially with the rise in kitchen gadgets like ‘the spiralizer’. I’ve been meaning to make some of my own, and having this dish has inspired me to do so. It was cold with a gazpacho-like pepper sauce. The courgette was cooked to perfection, and all that was on the plate tasted really fresh. It was light and the perfect entree to the banquet to follow. It had to be the vegetable moussaka. 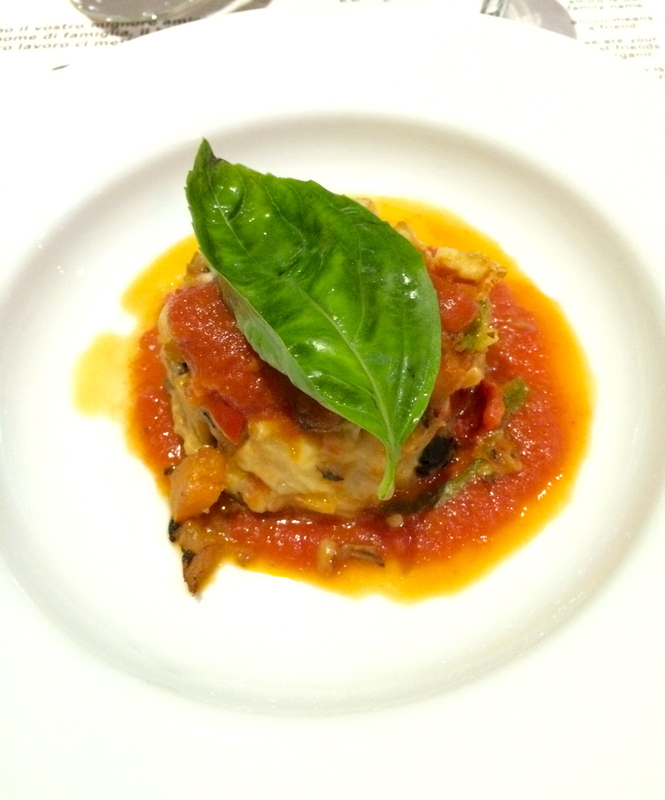 The vegan second course option, this dish was a well presented tower of gorgeously al-dente aubergine, carrot and tomato, topped with a vegan roux sauce and a crisp and delicious big basil leaf. I’m usually more of a starter and main girl myself, so I felt like I’d gone up in the world having a palate cleanser between courses. 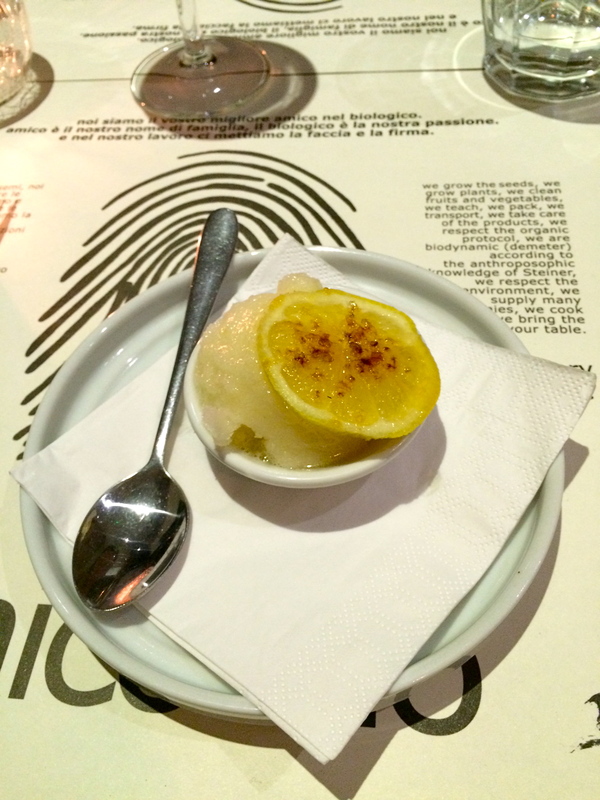 The lemon sorbet was sweet yet tarte, with a slightly unnecessary but warmly welcomed topping of caramalised lemon. 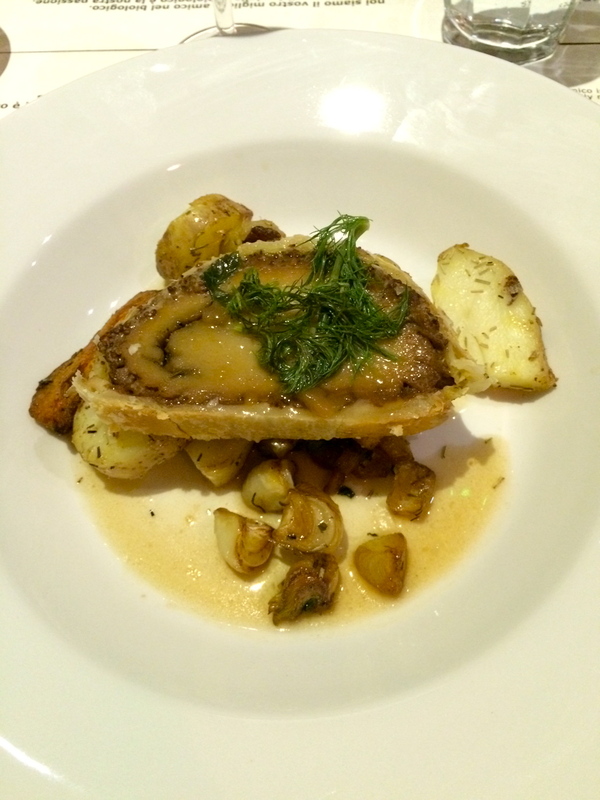 I went for the Arrosto di seitan ala Wellington aka seitan wrapped in puff pastry with seasonal vegetables. Seitan is a meat alternative made from gluten, also known as ‘wheat meat’. It’s got quite a chewy texture; a more meat-like consistency than other veggie meat substitutes. This dish was okay, but seemed more apt for a Sunday afternoon than a Saturday night. Served with herby roast potatoes, shallots and some other bits of roasted veg, it was quite flavoursome, but a little on the lukewarm side and not a showstopper like the previous courses. For the finale, I chose tiramisu. 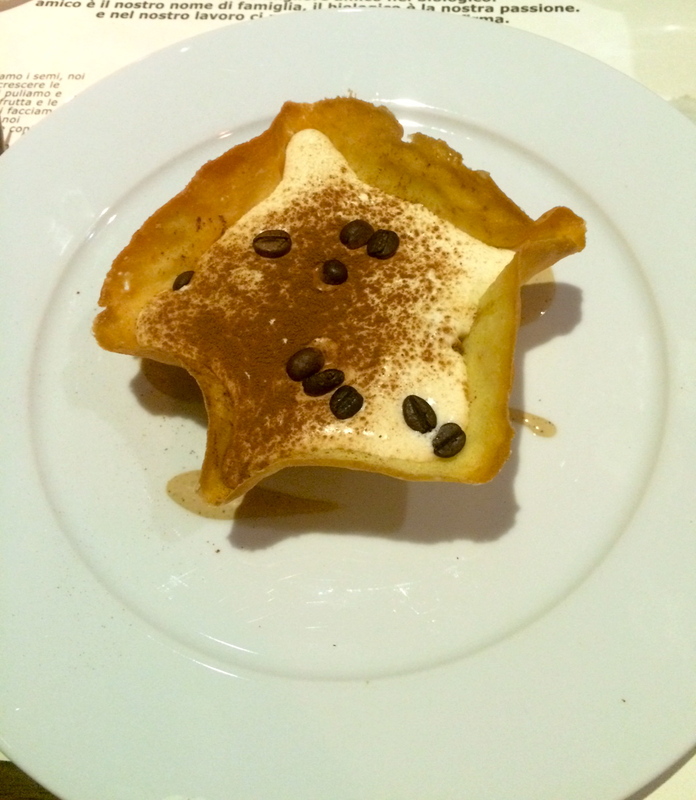 I’ve only actually had tiramisu once before, but this innovative spin on the creamy, coffee-based Italian dessert was delicious. A home-made biscuit basket layered with rum-infused sponge cake, oozing with rich mascarpone and topped with toasted coffee beans; phwoar. An indulgent ending to an exciting and tasty menu. The service was good and the food came promptly throughout the meal. I’d definitely recommend Amico Bio if you like healthy, fresh and innovative vegetarian food. If you found this review useful, please leave comments below.